A water-charged serum that immediately plumps thirsty skin while helping to intensively improve your skin appearance over time. Revolutionary antioxidant Vinanza Grape from New Zealand sauvignon blanc grapes helps powerfully protect and build resistance to damage caused by environmental aggressors and pollutants. Extract of mamaku black fern helps foster cell renewal, making this an everyday essential item for plump, healthy, youthful skin. Lavandula angustifolia (lavender) distillate*, aqua (Waiwera® artesian) water, Cyathea medullaris (mamaku black fern leaf) extract, Vitis vinifera (Vinanza Grape® grape seed) extract, Naticide® (natural preservative), caprylic/capric triglyceride, xanthan gum, essential oil fragrances of French rose & cardamon: benzyl benzoate+, cinnamyl alcohol+, citral+, citronellol+, d-Limonene+, eugenol+, farnesol+, geraniol+, linanool+. + Component of essential oil, * Certified organic ingredient. 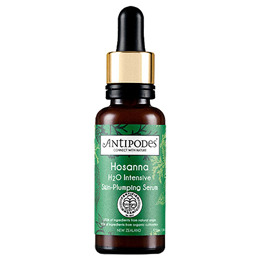 Apply to your face, neck and décolletage before your favourite Antipodes face oil or moisturiser. Use daily for immediate hydration and the best long-term results. Below are reviews of Antipodes Organic Hosanna Intensive Skin-Plumping Serum - 30ml by bodykind customers. If you have tried this product we'd love to hear what you think so please leave a review. A water-charged serum that immediately plumps thirsty skin while helping to intensively improve your skin appearance over time.